“Winners never quit and quitters never win” … “Train insane or remain the same”…”Go hard or go home”… sometimes it seems like the fitness industry is on a slogan-fuelled “my dad’s bigger than your dad” mission to prove which workout deserves the glory of being the most brutal. Overtraining Syndrome is the name given to the collective symptoms that present themselves when an athlete (usually during training for a competition or event) pushes their body beyond its ability to recover. The symptoms are emotional, physical and behavioural, including: feeling wiped out, irritable, sluggish, lacking concentration, weakened immune system (getting colds and bugs more often than usual), constant muscle soreness, depression, insomnia, increased injuries and decreased performance. As yet, there is no definitive test for Overtraining Syndrome and some commentators have expressed doubt about whether the recreational athlete can ever really OVERtrain, but whether or not you have the official “athlete version” of Overtraining Syndrome or you just feel burnt out, if you’re training hard but your results and/or performance is dropping and you feel constantly fatigued, the fact is that your training programme is probably outpacing your body’s capacity to recover, either physically and/or psychologically. You’re you – your usual, over energetic self, gyrating through the 8-step with all the flourish of a salsa-dancing musketeer. Your little ol’ Grandma, she’s trying to match your pace. You want to keep her on her toes, but if you go too quickly she won’t be able to keep up. Physically and mentally, you’ll end up leaving your poor Gma behind. If you don’t slow down and let her catch up, we’re going to have a broken hip on our hands. Put simply, if you overtrain and under recover, your hormonal, biological and neurochemical processes won’t be able to keep the pace and that will manifest itself in fatigue, under performance and injury. I single out group exercise here only because, in my experience as a group exercise instructor and PT, weight training circles are already familiar with the concept of overtraining, but it is often overlooked by group exercise enthusiasts who, given half the chance, would spend entire days hopping from class to class at their local gym. With CrossFit, it’s easy to see how over-enthusiastic attendance can quickly lead to overtraining, but I’ve seen the exact same issues with those who attend “softer” group exercise sessions, particularly intense cardio and HIIT-based training classes. One of the issues is that group exercise classes are designed for the masses, to accommodate beginners and more advanced participants alike, but whilst that might include progressions for particular exercises (say, jumping your kicks in a Combat class), once a participant is nailing all the advanced moves, week in, week out, how do they progress from there? Without progressive overload, their progress will stagnate. They might remain reasonably lean and fit, but they won’t be getting any leaner, stronger, faster or fitter. So what do they do? Train more, obviously! Unfortunately, the knee jerk reaction is not to train smarter, but to train even harder. Without being able to personalise their workouts, one of the few ways for group exercise junkies to add progressive overload is to increase the frequency of training, which means adding more and more classes = goodbye rest and recovery and hello overtraining! I’m not talking about overzealous attendance at aqua aerobics/the local community centre’s dumbbell diva class here (let’s face it, a Zumba overdose would require an impressive obsession with dance), but we all have our unique physical limits. Excessive physical overload coupled with inadequate recovery will eventually lead to a significant impact on performance, health and well-being. A healthy obsession with exercise is awesome, but if you’re training intensely or for long periods every single day, if your family are likely to send out a search party if they don’t see your daily “check-in” at the gym, if you find it difficult to take a rest day or feel anxious when you can’t workout, you could be in overtraining territory. Remember, as much as you might love ending a workout in a euphoric pool of your own sweat, it’s actually RESTING that builds you up and makes you stronger. When we sleep, our hormones come out to play like the creepy fairy-tale elves sneaking out to help the shoemaker in the dead of night. They gently rebalance us and restore all the stress we placed on our body during the day. If you are getting poor quality sleep or not sleeping for long enough, your body doesn’t have time to produce sufficient amounts of balancing hormones like testosterone and Human Growth Hormone, to aid tissue repair. It can also lead to the overproduction of other hormones like cortisol (the “stress hormone”). Stopping these hormonal processes short can cause the breakdown of muscle tissue, lead to increased fat storage and impaired insulin sensitivity. Aim for 7 to 10 hours of sleep a night! Make sure your diet includes the right amount and balance of protein, carbs and fat to fuel your workouts. Put the wrong fuel in and your training will stutter like a slipped clutch. Carbs are particularly important for those following a demanding training programme – depleted glycogen stores will lead to rapid fatigue and muscle tissue breakdown. Exactly how much protein, carbs and fat you need in a day depends on your body composition and your activity level. There’s a pretty good summary of it and a guide to calculating your own requirements here. Take a fitness holiday! And by “fitness holiday”, I don’t mean fly off to a wellness retreat in Mumbai, I mean take a week off fitnessing. A holiday from your usual schedule, every 6 weeks or so. This is the principle of deloading. Whilst deloading is long established among professional athletes and their trainers, the concept doesn’t seem to have whittled its way down to us mere mortals, but it can be just as useful for those of us who like to train so much that we risk taking it a little too far sometimes. The idea is that you take time out from your programme BEFORE symptoms of overtraining kick in, allowing your body to fully recover and for you to come back stronger. If the idea of an entire week off sounds like a restless nightmare of pacing, twiddling your thumbs and dreaming about burpees and plyo lunges, think of it as “active recovery” instead. Take a week away from hammering it at your CrossFit gym or your usual “press ups till you puke” HIIT class and go for a gentle swim, take a yoga class. Stretch. Walk. Enjoy the calm. Your body and your brain will thank you for it. Remember, preventing overtraining is all about adequate recovery – allowing your body to catch up with the stresses you are placing on it. 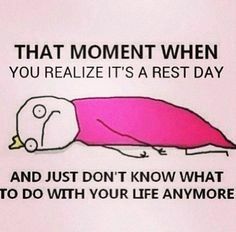 Forced rest periods and active recovery will help to prevent you from total breakdown. Learn to enjoy your rest: you earned it! Fist bump. Neo is a PT from Yorkshire, England. A former lawyer, she ditched the pinstripe to pursue her passion for fitness and is now much happier in trainers and trackies, pushing tyres around and copy writing for fit biz companies like strength equipment specialists, Full Metal Industries and Savage Strength.